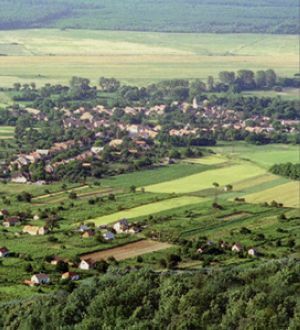 Large village with 577 inhabitants 25 km west of Ajka, near Somló, at the southern foot of Somló Hill. The outskirts of the village was the property of Pál Kinzsi and then the Erdődy family. The church is Gothic , later it was rebuilt in Baroque style. 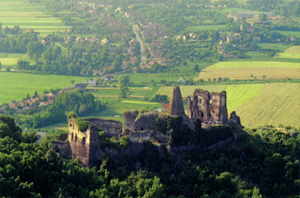 The Erdődy castle, built at the beginning of the 19th century, can be found to the northeast of the village. The main building of the castle was built on an artificially created hill in classicist style. The castle is surrounded by a 60-80 acre park with rich flora and fish ponds. The whole park is a nature conservation area. 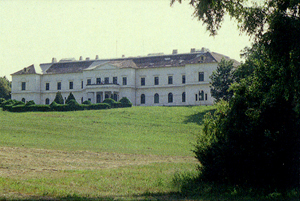 The castle houses a hospital and sanatorium at present. In the museum there is an exhibition on the history of Somló. There is an airport for sports aircrafts, where hot-air balloon contests are also held. Meeting of hot-air balloons is organized at the end of August.